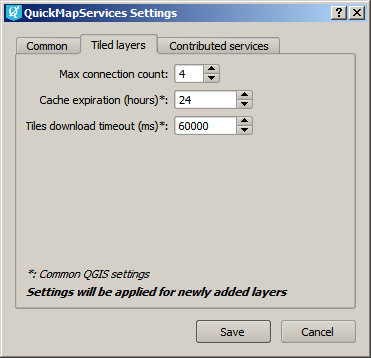 New version of QuickMapServices – QGIS plugin for painless adding of the basemaps as layers is out (more about the plugin). 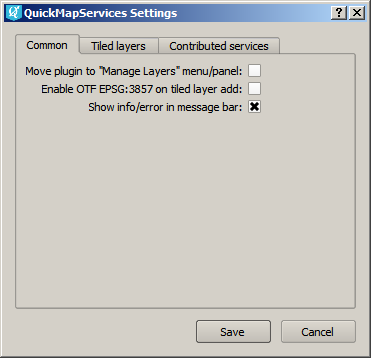 Enable OTF EPSG:3857 on adding tile layers (if checked, the project will get on-the-fly reprojection automatically turned on to EPSG: 3857 Pseudo Mercator if tile layer is added). 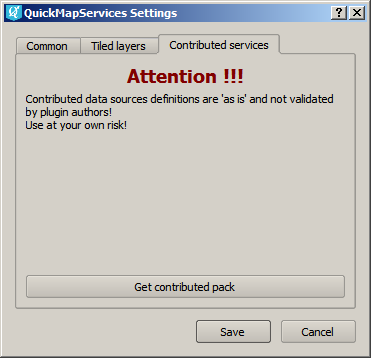 If you have your own favorite basemaps and tired of moving them around from a machine to machine and would like them to be included in QuickMapServices – now there is a easy way to do it. We set up a special repository for such descriptions which will act like a clearinghouse before they ‘graduate’ to core package. Just send us a pull request against this repository and we will most likely accept it. It will them become avalailable for everybody. The user will need to go to Settings, Contributed services tab and hit “Get contribute pack”. Important: we are NOT validating contributed services, they are provided and proof-of-concept for testing only. You can use quadkeys in services url (example for Bing). Services settings are now separate from the plugin and will not get removed after removal of the plugin or an update. ← NextGIS Mobile 2.1 is out! I have this tracback when I try to get the “contributed pack”. If you don’t have an account I’ll be happy to create an issue for you.